Placing Orders. How do I place an order? Minimums. Is there a minimum order? Returns. How do I return an item(s)? Catalogue. Can I get a catalogue by mail? P/Os. Do you accept Purchase Orders? Searching. How do I find a product? Payment. How do I pay for my purchases? Volume Discounts. Is there a large quantity discount? Changes. Can I add or delete items from my order if I change my mind? Approval. How are orders approved? Confirmation. How are orders confirmed? Canceling. What if I want to cancel an order? Shipping area. Do you ship outside the U.S. and Canada? Shipping costs. How much will shipping cost? Timing. How long do orders take to arrive? MSDS. Can I get an MSDS? Privacy. Do you share or sell customer data? Credentials. How long have you been in business? Password. What if I forget my TPW site password? Will my working order be saved if there is a power failure or I accidentally switch off my computer? Your credit card information is totally secure. It is protected by Network Solutions Secure Sockets Layer. This system utilizes the internet's strongest security technologies, including Secure Socket Layer (SSL), to insure your information is safe guarded from the moment you enter it until your transaction is completed. SSL is the latest internet security protocol that encrypts your data to prevent eavesdropping, tampering, or message forgery. We do not store any of your credit card data on our computers so you have to re-enter the data each time you order from our site. Therefore, you can rest assured that your data is not being stored on our computers and not available to any unauthorized user. To place an order just point to a category, find your product, enter the order quantity and click on the cart. Then go to "check out" and submit your information. No, We have no minimum orders on all domestic US and Canadian orders. E-mail us at orders@noskidding.com with your request. We'll give you a Return Authorization Number(RAN) number and proper return instructions. See our Return Policy for more details. Yes, contact us to request a catalogue. We accept Purchase Orders two ways. The first is you may order online using a PO and pay by major credit card or charge account or through our www.noskidding.com website which services our dealer, distributor and OEM customer base. Through our www.noskid.com website we do accept all major credit cards (MasterCard, Visa, and American Express). Please do add a PO No. to your order as a reference note. You can pay by major credit card (MasterCard, Visa, and American Express). Yes. If your volume requirement is significantly larger than the volume discounts shown on our site, merely e-mail us directly so we may submit a volume quote to you directly. Typically you will receive your volume quote the same day. Once you submit an order, you can make changes by e-mailing us at orders@noskidding.com and giving us your order number. We'll make every effort to adjust your order, unless it has already been processed and shipped. Your credit card number is assigned to your order within our system and will be charged before we ship the goods to you via UPS. If there is a problem with processing your credit card number you will be notified in a timely manner, usually the same day or next business day. You'll get an immediate confirmation on-screen plus an order number, which you can print out. A follow-up e-mail confirmation with your order information will also be sent. You need to send an e-mail to orders@noskidding.com. Most orders go straight to our warehouse and we may not be able to intercept them in time. If you pass the cancellation point, then contact us when the order arrives about returning it. See our Return Policy for all the specifics. We ship within the United States, Canada, Mexico and the Caribbean. If you are inquiring from outside the United States, Canada, Mexico and the Caribbean, please inquire through our www.noskidding.com website or e-mail us at: sales@noskidding.com Please advise us which country you are located in so that we can forward your inquiry to our local distributor for follow up. If your interest is in becoming a No Skidding dealer or distributor, please advise us of the country that is of interest. If we do not already have distribution in place, we would be pleased to discuss the opportunity with you. If we do have a master distributor in place, there may indeed be the opportunity for your company to become a sub-distributor or dealer within such a market. We are always looking for distributors in markets that we currently do not have distribution and our established master distributors are always looking for regional dealers or sub distributors within their respective markets. 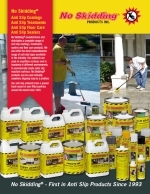 Please e-mail sales@noskidding.com for product inquiries or dealer inquiries outside of North America. We ship via UPS and your shipping cost will be calculated based upon UPS's current shipping costs upon check out. A. Once your order has shipped, we'll send you an e-mail to let you know that your order is on its way. You may also check the status using the My Account link at the top of your screen, and choosing the Order History option. A. We'll give you the tracking number of your order when we e-mail your shipping notification. You'll be able to track your order through links provided at northernsafety.com. Your tracking number will also be available on the Order History page. Use the link located at the top of the page, and choose the Order History option. We normally ship the next business day. You can check the status of any order by e-mailing us at orders@noskidding.com or by selecting the order status from the Customer Service/Help menu. Please be sure to give us your order number. We don't share information with or sell data to 3rd parties. We collect your contact and billing information to process and ship your orders and send you information about noskid.com when requested or necessary. 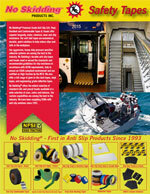 Since 1993 our parent company, No Skidding Products Inc. has been a pioneer in the development, manufacture and distribution of the most comprehensive and innovative range of slip resistant products available anywhere. No Skidding® products are distributed in over forty countries around the world. www.noskid.com is the e-commerce site for No Skidding Products Inc., specifically for our North American customers. Simply tell us which e-mail address you used to create your account and we will e-mail your password to you. Forgot your password? If you were logged in under your account, your order will be saved.